Matthew Richards won last Sunday’s winter finale at Hebden Bridge Golf Club, the top 16 stableford play-off. Despite atrocious weather there was some amazing scoring with Richards notching 41 points, followed by Jonny Cockroft with 38 points and Ash Hewitt in third. Cockroft was keen to tell anyone who would listen later in the clubhouse that if he’d been able to find his plugged ball he may well have won, adding that the R & A should perhaps look at changing the rules. Hewitt, who had won the winter league the previous Sunday, was in the money yet again but generously put his winnings behind the bar. Captain Jonathan Sutcliffe thanked steward Geoff Dardis for his hard work since taking over six months ago and then handed over the Winter League prizes, assisted by Noel Russell, son of the late Sheamus Russell after whom the trophy is named. Hewitt won with 77 points, closely followed by Gav Brumby with 75, Steve Scholes on 72 and Lee Amos and Matthew Fisher tied in fourth on 64 points. The next Halifax-Huddersfield Alliance meeting of the season takes place at Bradley Park next Tuesday. Hebden Bridge have been represented in four of the eight events so far while Todmorden had players just at Ogden in late November. 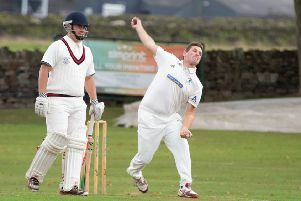 The Halifax-Huddersfield Union season gets under way with a match between the senior and junior representative sides at Saddleworth on Sunday, April 12. Hebden Bridge and Todmorden are among the six venues to be used for the first round of the scratch and handicap foursomes competition on Monday, May 18. Hebden Bridge is one of three venues for the second round of the junior foursomes on Monday, June 15. Todmorden will co-host the junior match play quarter finals, along with Bradley Park, on Tuesday, July 21.